There is a lot of progress still to be made when it comes to batteries and energy storage. The problem of storing energy is often underestimated however. Gradual evolution in the world of batteries is more likely than a revolution. TU Delft's new batteries lab will focus primarily on research into potential alternatives for what is currently the standard technology: the lithium-ion battery. "We are living in confusing times when it comes to batteries and energy storage", says TU Delft's Prof. Fokko Mulder. In his view, misconceptions have emerged about what is and is not possible in terms of energy storage, partly because of the rise of renewable sources such as wind and solar energy. (The misconceptions start around the fact that only about 13% of the energy we consume ‘consists of’ electricity, but that is likely to be significantly higher in a renewable future). Large-scale energy storage is essential because the supply of power from renewable energy sources, such as wind and solar energy, fluctuates by its very nature. You cannot store electricity, which means alternative solutions need to be devised. "Current expectations are slightly too high with regard to the rapid introduction of renewable energy and the potential role of batteries in large-scale energy storage. For example, a lot can be achieved in the field of energy storage and buffering using batteries in electric cars. But that method can only be used to store a very small portion of future renewable electricity production, even if everyone in the Netherlands were to drive fully electric vehicles." "Technologically and financially, it comes down to the fact that batteries alone are simply not sufficient to offset all of the major peaks and troughs in renewable energy production across the year", Mulder explains. "Storage over a longer period is particularly inefficient and expensive using batteries. Completely different systems are required for that." Whatever the case, there is a real need for electricity storage, both for the short and longer terms (weeks or seasons). Although batteries are best for short-term storage, artificially-produced fuels such as hydrogen are most suitable for long-term energy storage. Mulder sees more potential in an alternative, combined approach for the large-scale storage of energy from renewable sources. The ‘battolyser’ developed by his group is an example of this. It is based on an old-fashioned nickel-iron battery. During charging, the electrodes on this battery form two materials (NiOOH and reduced Fe). In the world of electrolysis, these materials are known as the catalyst for the electrochemical reaction that produces hydrogen and oxygen. In their charged state, the electrodes enable water to be electrolysed. According to Mulder, the fact that nickel-iron batteries also produce hydrogen gas while charging was always regarded as a drawback and that was one of the reasons why other types of battery were ultimately more successful. Now, though, this could actually turn out to be an advantage. "Electricity and hydrogen have always been seen as two separate, even competing, solutions for energy storage," says Mulder. "With the battolyser we have the first integrated battery electrolysis system, which can store and supply electricity very efficiently as a battery, and when the battery is full, it automatically starts splitting water into hydrogen and oxygen using electrolysis. The battolyser has also been found to be stable, both in battery and electrolysis mode, even under long, intensive charging, discharging and hydrogen production. This means that the battolyser brings together the infrastructure for electricity storage with that for hydrogen production in a natural way for the very first time. We need both battery storage and fuels." All things considered, Mulder expects to see gradual progress in the development of energy storage and batteries, driven by an increasing need for storage. Dr Erik Kelder from TU Delft's Fundamental Aspects of Materials and Energy (FAME) group confirms this view. "In the future, I think it is much more likely that we will see evolution in the world of batteries rather than a revolution." According to Kelder, there has been significant growth in battery research in recent years and it has gained in strategic importance. Mobile applications are the main driver for batteries. But batteries have also become important tools for applications other than mobile electronics, such as electric vehicles and human implants. Viewed strategically, Europe has only a very small portion of world production. China, South Korea, Japan and the US are clearly more important players. "There are three determining factors in the development of batteries: safety, cost price and energy density (the amount of energy you can store in a battery). Ultimately, everything in the battery world starts with safety. Just one incident can leave you right back where you started", says Kelder. "Aside from safety, the main focus of science is on increasing energy density, enabling more energy to be stored in a battery." Currently, the standard technology is the lithium-ion battery. Kelder believes that this still has some potential for technological development. "However, the best you can probably hope for is an increase in energy density by a factor of 1.5. If you want to make major progress in energy density, there needs to be an alternative for the Li-ion battery." Developing alternatives was precisely the reason why the new TU Delft batteries lab was launched earlier this year (officially opened in April at the Reactor Institute Delft or RID). 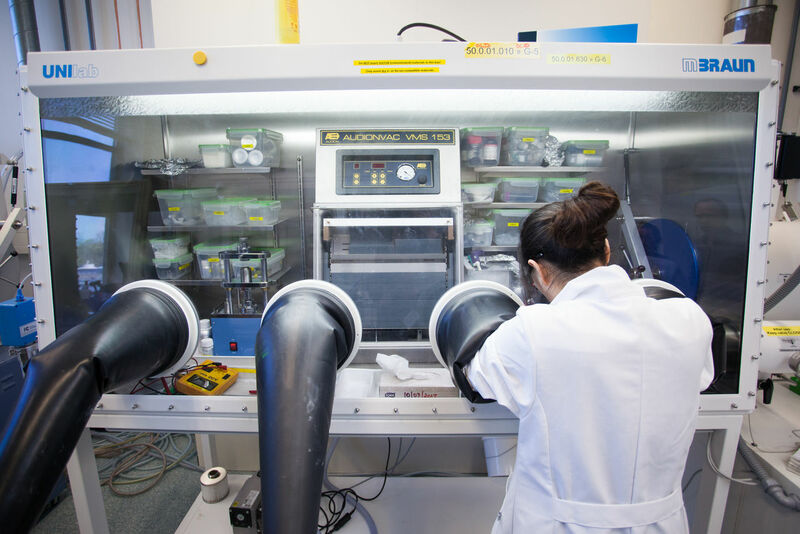 Teams of researchers are working there on the next generation of batteries. Kelder explains that, from a scientific perspective, there are currently numerous options on the table. "All kinds of different concepts are being researched. Personally, I think that a Li-sulphur variant could serve as an interim solution on the way towards a completely new generation of batteries." An alternative approach, such as replacing the lithium with sodium, would not provide much benefit, according to Kelder. "You would be better advised to replace the lithium with calcium or magnesium, for example. There are also other potential variants using zinc, air and water." Kelder points out that it is difficult to predict what the best option will be. But it is important to realise that these potential alternatives will probably need time before they are ready for use in applications and start to constitute a genuine threat to Li-ion batteries. "That could actually take decades. Above all, there needs to be a lot more fundamental material research." So it was clearly high time for a new batteries lab. This one can even claim to be the only one of its kind in the Netherlands. It has been enlarged and offers even more possibilities for research. In addition, all facilities in the labs are centrally located alongside each other and can be combined with the infrastructure of the RID, including ‘operando XRD’ techniques and neutron depth profiling, neutron diffraction and solid state NMR. These techniques can, for example, be used to make lithium atoms visible. In the lab, various coating and preparation techniques are applied and scanning electrochemical microscopy is linked with atomic force microscopy, enabling batteries to be viewed at atomic scale. This will make it possible to gain a better understanding of the complex processes in batteries, ultimately enabling better batteries to be developed.